Apple just announced what it plans to do with the $98 billion of cash and cash equivalents it has amassed since the runaway success of its iPhone and iPad mobile devices. The shareholders have been clamoring for a while that Apple ought to do something with all that cash, and reward those who have been investing in its shares. Not that it hasn't been rewarding them with the share price ramping up exponentially to get to the most valuable company status, but a dividend is a dividend. That's exactly what Apple will start doling out each quarter, starting with the July one, to the tune of $2.65 a share. Not too shabby, but to soothe the inevitable stock price drop with the size of the dividend, Apple will also start buying back its own shares in the September quarter, and has set aside $10 billion for that. Peter Oppenheimer, Apple’s CFO, calculated that "Combining dividends, share repurchases, and cash used to net-share-settle vesting RSUs, we anticipate utilizing approximately $45 billion of domestic cash in the first three years of our programs". Well, it seems that someone in the market has "anticipated" those $45 billion coming the shareholders way over the next 3 years, since Apple's shares have gained an almost unthinkable amount for a large market cap in the last weeks. The first dividend program for Apple since 1995 also shows that its explosive growth period might be stepping aside for a more balanced approach, while still maintaining high margins. That's it, I expected more. Very disappointing!!! You're pathetic....and boring, as usual. apple is trying to woo andriod people into buying their i products again. It's funny that Apple is trying to buy back their stocks. It seems to me that Apple doesn't want to pay the dividends to its share holders, & that is why they are trying to buy the stocks back! Apple is just a very funny corporation. Their business practices are just so weird & very questionable. On the contrary, this is a major play by Apple. Apple apparently wants to become an elite-only trading option... it is evident from this announcement. What does a company do when they want to make themselves unavailable to common investors and day-traders, and only cater to the high-rolling uber-wealthy and top-notch fund managers? I'll tell you... you announce a super-competitive per-share dividend to rake in elite investors who want a regular cash return on their investments, and offer to buy back shares from common traders who got lucky enough to hang on to early Apple shares (which are now more than mature). This increases the risks of staying in for common investors, while offering them a lucrative risk-free way out, and increases the rewards for those who can afford to enter the market when the stock is already at a high. For Apple, the best that can happen is that Apple's shares skyrocket faster as elites see a stock that is now exclusively catering to them, and the worst that can happen is that Apple ends up owning more of its own shares and is thus less accountable to shareholders. I'd say Apple sees this as a big fat win-win. Lots of lucky early investors will be jumping on that buyout, while the major players will remain to get the large and steady dividends every quarter. It is mostly just a great way to get rid of the day-trader riff-raff, first and foremost... and will create an even deeper culture of elitist exclusivity among investors and fund managers than we have already seen among Apple's consumers. Look Apple stock is already very high, so your point in the elite-only players has been established in the last couple of years if not longer. The day traders have not been able to buy Apple stock at the very minimum the last 2 years or more, & if they can buy the Apple stock then they should. Their money is green just like those elite-only players you talk about. I bought 50 shares of Apple stock in 2007 when the iPhone first was announced & it was pretty hefty purchase then, now you have to have a huge sum of money to purchase Apple stock. Essentially Apple stock have been elite for years. I have to disagree with your elite notion because money is money, if you can afford Apple stock you are already elite in your finances day trader or not. 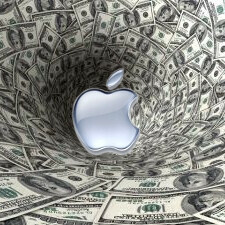 Apple stock prices will go up based on their products NOT catering on the elite as you are alluding too. Based on Apple’s sinister history to me it’s more plausible that Apple is buying back their shares so they don’t have to pay huge dividends & to protect themselves in case something happens to Apple. For instance let’s say the next couple of Apple products are sub-par or they lose lots of money from something devastating, they can sell those stocks that they bought back to help them right the ship. The Android monster is a REAL threat to Apple & this might be a preemptive move by Apple to secure themselves or it could be that Apple wants all the dividend profits for themselves. We really don’t know the answer to this. Apple is not doing this to cater to those elite-only players this is for their own interest, nothing more & most definitely nothing less. If Apple invests $45 billion in buying back their own stock in the next three years, then they will only be able to buy back, at most, 15% of it over that period. Apple doesn't have the cash-on-hand to buy back enough of their own stock to make such a difference in their quarterly dividend payouts, as you suggest. If Apple wanted to do something different and competitive against Google, then they could much more easily, and with much less risk, have just split their stock 2 for 1... and maybe given a smaller, more conventional dividend. Apple did not decrease their risk, which I think they could have done by doing a stock split and, in doing so, would have better braced themselves against Google. Instead, they ADDED risk to their position, and offered huge rewards to those who have the resources to handle such risk. Everything Apple has done in the past year has told me plainly that they are playing a VERY temporary short-term game. Rather than working to defeat Android through natural market forces over a steady time-table, they are instead artificially forcing litigation through at a break-neck pace as if they are running out of time to achieve this goal and cannot wait for five to seven years for it to occur naturally. Now they are doing this stock play, which strikes me as a short-term value burst strategy rather than a longer term competitive bracing play. For me, this all points at a quick burst into space, in terms of corporate value, which will likely be followed by sudden decline if it is not somehow backed by some as-yet-unforeseen plateau to support them once they get there, or a golden-parachute to bail out the biggest winners when it all collapses. So only "elite" investors like dividends? Where do you guys get this junk from? I liked dividends... and I was no elite investor. I didn't say that anybody didn't like dividends, but it is sort of a fact that the bigger the dividend, the more it attracts the high-end investors. It is a way of ensuring that high risks are balanced with high rewards on a regular schedule. The problem is you made it sound like an elitist conspiracy. Of course a good dividend payout will attract investors, but that's not a bad thing. Also Apple's stock is not high risk. Ummm... is there not an elitist conspiracy somewhere? Are you dumb? If Apple didn't want to pay dividends they wouldn't. They voluntarily chose to pay dividends. Questionable by rewarding their investors? You're just a hater and nothing Apple does will make you happy. You are the dumb one, Apple is getting heat from their share holders & that is why they are caving. They are also buying back their stock so they don't have to deal with their shareholders. My point is they DON'T want to pay dividends & that is why I THINK they are trying to buy back their stocks. They want to shut their share holders up. READ THE ARTICLE TITLE: Apple "GIVES IN" to shareholder demands with $2.65 quarterly dividend and $10 billion stock buyback Is it clear to you now. I don't like Apple's practices "yes" but I call it for what it is, & this indeed is questionable. It has nothing to do with hate so get over yourself buddy, it’s not that serious! Thumb yourself up and me down is a little childish don't you think? Did you read the rest of the article AFTER the title that explains the buy back is to avoid a price drop of their stock? People complain that Apple is greedy and when Apple is going to give $35 billion to shareholders you complain about that too? Tell me what is it that Apple can do that would make you happy? Ok no need to make accusations about the thumbing, that is just plain old silly, & if that is best you can come up with then fine go ahead. Also you have the gall to call some someone childish when you indeed was the first to do a childish thing like call someone dumb. If you don't agree with my point of view that is fine but please don't be childish & call someone dumb because of it. It makes you look weak. I never believe the Apple's rhetoric, Apple is not what you think it is. They can just be saying that just to try to look good. Facts are facts, Apple only did this to calm down the backlash from their share holders as the title is implying. Do you know how I know you thumbed yourself up? When you thing yourself up and then deny it it makes you look even dumber than before. take some of those billions and use it to buy better and humane working conditions for their slaves. that would make me happy. @SuperAndroidEvo: I think the two things that hinder your ability to come across as an unbiased individual simply reviewing an article on Apple's financial practices and plans are: A) Your user name. It sets a clear tone of bias before your fingers have even struck the keys. B) Your grammar and punctuation. Foregoing 'A', you had my attention up until the excessive use of '&' in place of 'and'. I have a very hard time taking anyone seriously who reverts to teenage girl text-speak. As far as Apple's plan for their money, I am fairly certain that, no matter what they decided to do with it, people would complain. The fact that a Phandroid is leading the charge on here did not surprise me either. Ok drtech, this is coming from the one who calls anyone who has an opinion about Apple that he doesn't agree with, an Apple hater. I guess the "d" in drtech means delusional huh?